In 1689 the Scottish Episcopal Church was disestablished and disendowed because of its adherence to the Jacobite cause. The two Perth clergy were turned out of St John’s Kirk which was the only Church in the city of Perth. At first things were very difficult but by the Toleration Act of 1712, Episcopalians were allowed to seek other meeting places, and in Perth they asked for the use of the unoccupied East Church, the Choir of St John’s Kirk, which in those days was divided into three. Perth Presbytery refused this and so they found a Meeting House elsewhere and various clergy kept services going. Then came Good Queen Anne’s death, followed by the first Jacobite Rebellion in 1715. After it, the Perth episcopalian clergyman, Rev Henry Murray, and his assistant had to leave the city, and their Meeting House was demolished. By an Act passed in 1719 episcopalian clergy were forbidden to hold services unless they took an oath of loyalty to King George I. If they disobeyed they were imprisoned and their Meeting House closed for six months. However, Mr Murray with his assistant, Rev Laurence Drummond, returned in 1722. In 1735 Mr Murray died. Mr Drummond was a semi-invalid, and so in 1739 Rev Robert Lyon, a young man, was asked to come and assist him. This proved to be an unfortunate choice, as Mr Lyon introduced practices of which some of the congregation disapproved. They were so dissatisfied that they invited another clergyman, Rev George Sempill, to take his place. Bishop Rattray, however, officially deposed Mr Sempill but he continued to minister to his congregation. Mr Lyon and those who approved of his practices had to rent another Meeting House, and so out of this schism there came to be two episcopal congregations in Perth. It had been difficult enough after the 1715 Jacobite Rebellion for episcopalians to worship. Now came a further catastrophe – the 1745 Rebellion. Rev Robert Lyon was an enthusiastic follower of Prince Charles and went as Chaplain to one of the Jacobite regiments. When the rebellion failed, he was tried and executed for his part in it. Many Perth episcopalians of both congregations were imprisoned under very harsh conditions, including both Mr Drummond and Mr Sempill. The latter was accused of breaking the law which said that he might only minister to his own family and no more than four others, in his own house. Even Perth Presbytery were concerned about Mr Sempill, now an old man, fearing that prison conditions would kill him. The Scottish Bishops continued to cling to their Jacobitism, and their clergy and congregations where therefore always liable to persecution and imprisonment. The Rev G Innes, ministering when he could to the other congregation, said at this time “I am hunted and watched every day”. After the Rebellions of 1715 and 1745 there had sprung up, in many parts of Scotland, congregations which called themselves “English Chapels” and recognised the authority of an English or Irish Bishop. By this means, and by giving up their Jacobitism, they gained freedom from persecution. In 1750 that Perth congregation which had rejected Rev Robert Lyon decided to do this. 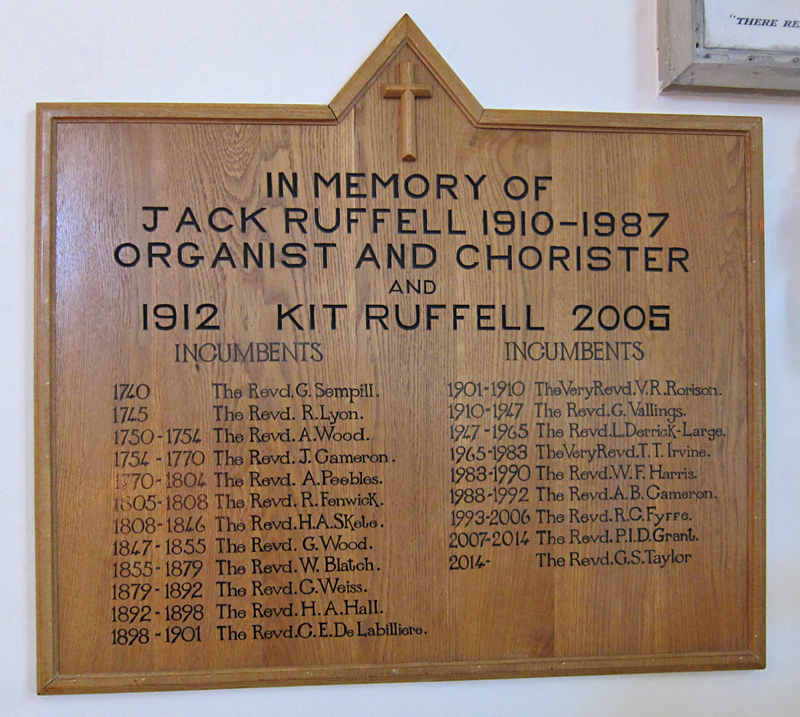 It may be said that St John’s congregation is directly descended therefore from Mr Sempill’s congregation, and from the “English Chapel” set up in this way. During the rest of the eighteenth century this congregation worshipped in the old Parliament House, off the High Street. The remains of this ancient building were revealed in the “rescue dig”, before the present Marks and Spencers department store was built. By 1793 the Parliament House was in a state of dilapidation and so it was decided that a new Chapel should be built. In 1795 a site in Princes Street was bought, and in 1800 Colonel Mark Wood of Potterhill made it over to the congregation for £70. A condition of the sale was that “a place of worship in which only the services of the Church of England should be performed, must be built upon this spot”. In the same year the Chapel was built and the congregation moved in. The local nobility and gentry were greatly involved, for “Sir William Nairne, Lord Dunsinane, paid off the debt of about £550 after completion”, and in 1802 the Earls of Kinnoull and Mansfield joined the congregation. In 1809 an organ was installed in the Chapel – probably the first Church organ in Perth since the reformation. In 1810, according to the minutes, the Vestry decided that “considering that the time of service is lengthened by the organ, it will be necessary for to go in at 11 o’clock”. During the 18th century, the episcopalian clergy had worn the black gown which is still the dress of the Presbyterian minister. In 1808, however, Rev H Skete came to the Chapel and he was probably the first in Perth to wear a surplice. When he wore it to conduct a funeral, stones were thrown at him by some of the populace! Mr Skete had about 120 communicants. He continued the separateness of St John’s by renouncing his allegiance to the Bishop in 1810. He remained Rector until his death in 1846. Now comes a period of great importance in our history. In 1847 Rev George Wood came to be Rector. At this time Bishop Torry of St Andrews made an approach to the congregation and Mr Word advocated reconciliation with the Scottish Episcopal Church. At a special general meeting of the congregation in the George Hotel 108 voted in favour of reconciliation, 17 against. In 1849 a document of reconciliation was drawn up, signed by Bishop Torry, Mr Wood and members of the Vestry. It was decided that the name “English Chapel” was no longer appropriate and should be changed to “St John the Baptist Episcopal Chapel”. So ended at last the schism which had begun in 1740. By this time the Chapel was too small for the growing congregation. There was no room for free seating for the poorer people, nor was there room to accommodate the many English people who had come to Perth with the building of the railway. In 1850, therefore, the Chapel was demolished to make way for a larger Church. The congregation moved into temporary quarters in Kinnoull Street where Gloag’s Whisky Bond stood prior to being replaced by flats. The foundation stone of the present church was laid on September 28, 1850. The new church had been completed by June 1851. On October 22nd it was consecrated by the Bishop of Edinburgh, Bishop Terrot, since Bishop Torry of St Andrews was too old and infirm to attend. Morning Prayer and Communion followed the Consecration, about 80 communicants being present. After lunch in the George Hotel, Evening Prayer was conducted at 4.00pm followed by the Confirmation of more than 30 candidates. A writer at the time said that “Everyone was pleased and delighted at the manner in which the service was conducted, and with everything connected with the day’s proceedings”. A new pulpit, of Caen stone, was added in the 1850s and in 1872 this was enriched with carving by Miss Mary Grant. She was the daughter of Mr John Grant of Kilgraston, who was a member of the Vestry and a trustee of St John’s. Mary Grant was one of the first women to be a professional sculptor, and her works were regularly exhibited in the Royal Academy. A new organ was put in in 1857, and a still better one in 1890. From 1860 for about ten years, Bishop Wordsworth and his family attended St John’s, there having been a disagreement between himself and the staff at the Cathedral. He, however, left St John’s because he felt not enough was being done to provide a place of worship for the poorer people. He did this by opening the Chapel of St Andrew, near the railway station. The Chapel had a school attached, and in 1876, when the Bishop went to live in St Andrews, both came under the care of St John’s. This building has also been replaced with housing in recent years. It had been said in 1855 that St John’s had the largest congregation in the diocese. When Rev George Wood left, Bishop Wordsworth often preached in St John’s to help out in the vacancy. This Bishop had at one time proposed a union of the two Episcopal congregations in Perth, and the building of a fine new church to accommodate them. The plans for this Church were, in fact, drawn up and, according to Dean Farquhar, they hung on the wall of St John’s Vestry until at least 1894. But the Dean himself admits that the union was impracticable as the two congregations favoured two different styles of worship, and he says that “it was perhaps wisest, after all, to allow the two types of Churchmen to go their ways as friendly members of the same Communion, rather than to force on a marriage of convenience between them”. St John’s was in a flourishing condition during this period. In 1871 there were 650 members. By 1873 there were not enough sittings for those who applied, and not nearly enough free places for those who wanted them. This was partly due to the fact that “the military” worshipped in St John’s. It is pleasant also to read that “the subscriptions forwarded to headquarters have long been amongst the very best in the Diocese”. St John’s was paying its way! In 1871 clergy were still wearing the black gown. In that year the book of “Hymns, Ancient and Modern” was introduced. At the same time the afternoon service was dropped and an evening service introduced instead. In 1893 a new Rectory was purchased at 6 Dupplin Terrace which remained as the Rectory until 1991 when it was sold. In contrast to the two preceding centuries the twentieth century has been a more settled period in the life of St John’s. Such could not be said for the world at large which, in the first half of the century, had been engaged in two World Wars. The Rector of the time, Rev George Vallings, went to the front during the 1st World War as Chaplain. Families at St John’s, like others, faced the anxiety of those times. A Memorial to those who died in these two wars in now placed on the south wall of the sanctuary and the Chapel under the south gallery was dedicated as a War Memorial in 1951. The ecumenical movement has been a very significant development in the twentieth century and in Perth joint worship, study and action are regular features of church life. Episcopal clergy have returned on occasions to preach and celebrate the sacrament in St John’s Kirk, so healing the memories of 300 years ago! It should be noted, given the past history of the two episcopal congregations in Perth, that a growing relations of friendship and shared ministry has developed in recent years between St John’s and St Ninian’s Cathedral. Further historical information can be found in The Episcopal History of Perth, 1689-1894 by George Farquhar, from which book the greater part of this short history has been drawn.